13 Oct 2017 --- Savings of €6.20 billion (US$7.33 billion) a year could be generated through the daily consumption of 10mg of lutein in combination with 2mg of zeaxanthin by adults aged 50 and older in the EU with age-related macular degeneration (AMD). This is according to a new study produced by Frost & Sullivan. AMD is a progressive degenerative eye disease and a major cause of vision loss among older Europeans. AMD inhibits the ability to see objects directly ahead and can cause a progressive decline in an individual's independence and ability to perform daily activities. Across the EU, 17.1 million people are living with AMD and numbers are expected to increase by over 30 percent until 2040. Around 2.5 million of these 17.1 million cases are the more costly severe/late stage AMD. The study found that the lutein zeaxanthin combination may reduce the risk of a transition from mild to severe/late stage AMD by 7 percent. Frost & Sullivan has calculated that the total cost of managing the consequences of severe/late-stage AMD in the EU is expected to be €89.46 billion per year. This includes the direct costs of treating and managing AMD and the indirect costs related to long-term care. This translates to an annual cost of a transition from mild to severe AMD of € 34,805 per transition in the EU. 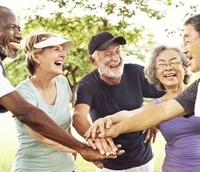 “Following an analysis of the available science, Frost & Sullivan's research team concluded that consumption of 10mg of lutein and 2mg of zeaxanthin a day by EU adults aged 50 and older with mild AMD would cut their risk of experiencing a transition to the more severe and costly late stage AMD by 7 percent,” says Christopher J. Shanahan, Global Director at Frost & Sullivan. Click to Enlarge“Principally, it is increasingly difficult to ignore the fact that supplementation can play a critical role in the future of how healthcare in the EU is funded, resourced and delivered,” Shanahan stated. The release of the full analysis of the findings on the benefits of using lutein and zeaxanthin food supplements will coincide with a webinar on 2 November, with experts from Frost & Sullivan, BASF, Kemin, DSM, University Hospital of Bordeaux and the University Medical Center Groningen (UMCG). 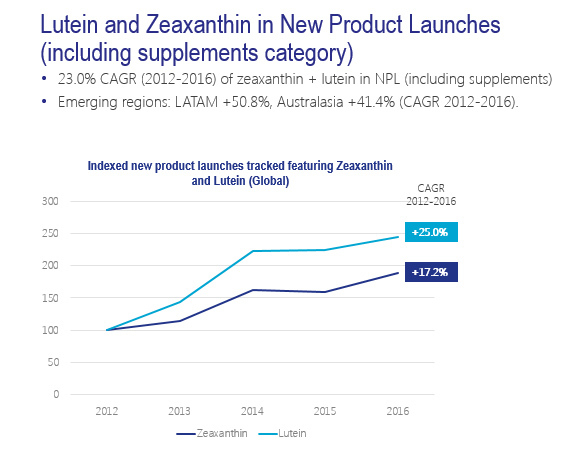 *Base of 100 for both lutein and zeaxanthin, but start product launch numbers differ for both.